Bob Bellow, named "Robert Brusen" when he was born in Menomonie, Wisconsin, Bob Bellows' parents wasted no time with his musical education. At the age of four his father sat him on a piano bench and said, "Play!" He has been playing and singing ever since. First in his hometown, and now all over the world! 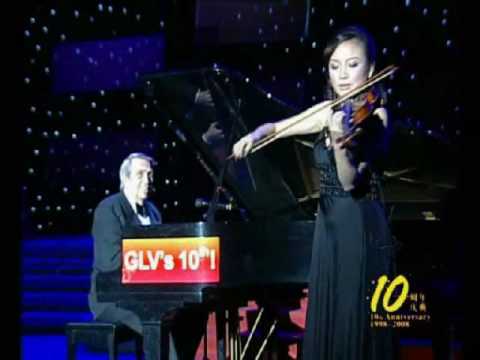 Bob Bellows with the romantic Rainbow (Zhao Hong) and her magic Violin performing at Gateway Lanuage Village, a total immersion English school,10th anniversary show. Bob Bellows represented in China by China-Art Culture Co.LTD., Hangzhou, China. WATCH VIDEO BELOWAt the age of 15 he started touring with a small group. Realizing he needed to learn more, Bob enrolled in the McPhail Conservatory of Music in Minneapolis. With a fine musical education, piano and operatic voice training, he set out again on his musical journey to become the finely polished performer he is today. Winning the "Stairway to Stardom" contest at WCCO Radio Minneapolis earned him an invitation to sing "Love is a Many Splendored Thing", at the World Premiere of the movie in New York City. He went on to experiment with theatre. His performances as the lead in "Life with Father" and "You Can't Take it With You" in regional theatre were widely acclaimed. Bob's early days of experimentation in different areas of show business honed his skills as a showman which led to interviews on many radio and TV talk shows. But music is Bob's heart and soul. If you ask him, he will tell you, he feels he is best in live concert venues. He has performed for diplomats, ambassadors and diversified audiences in many countries - Africa, Russia, Europe, Japan, China, Hong Kong, Taiwan and Macau as well as the United States. Bob has earned his place as an internationally acclaimed performer, winning the hearts of his fans in concert halls, night clubs and music colleges - performing jazz, cabaret, Broadway show tunes and love songs that bring memories, tears, laughter and romance to his listeners. The Bellows' and the Ibuski's - JapanBob will tell you, he believes that music is a ladder for the soul. He shares his gift freely with everyone, whether in fine music halls and theatres in Russia, hotels in the Caribbean and South America, luxury cruise ships, or in the "gers" (tents) of the nomad tribes of Mongolia. John D. MacDonald, the popular author of mystery novels wrote of Bob, "I am intrigued by this good man - in good voice - creating all those nostalgias, big and small, which are a necessary magic to us all." Sammy Cahn, song writer for Frank Sinatra and famous composer for the stars, after one of Bob's performances sent him a note: "You are a "P.P.P" which stands for "Proper Piano Player" and that is the highest compliment I know." An Asian critic wrote: "Bob Bellows is the absolute essence of the All-American entertainer with an international flair." "I Wish You Love" is a reprise of Bob's personal favorites from his previously released albums. His first CD release, "Straight Down the Middle" leads off with the famous golf song written by Sammy Cahn. Bob and his friends, internationally recognized jazz artists, are featured. Bonus tracks include Bob's Jazz Stride Piano. Bob is committed to serving the goals of an international community whether at home or abroad, through his work and in his personal life. Bob and his wife, Jene, make their home in Florida and China. Bob is an Entertainer, a Showman.He is a Jazz Pianist and Singer who, at 82 years of age, is an example of how one’s life and career can be most active and creative. Playing in stadiums and heaters throughout Asia, singing in multiple languages, Bob has found a platform for expressing his belief that the world is truly one. One of his favorite sayings is: “Luck is hard work”. Bob feels that by loving all humanity, appreciating the diversity of all, good deeds, peaceful thoughts and high standards in participation in the Arts, we can begin to have a better world. Beginning piano at the age of four and singing since 15 Bob has had a long successful life in show business. He has been a Bahá'í for 40 years. This has been the greatest gift of his life, he says. His appreciation for his wife Jene (“Tai-Tai”) of 44 years is in the forefront, because Jene coached him along the slow path he took to come to a sense of well being and fulfillment of his purpose for living. William Sears was his greatest influence and his love for this giant of a man is unlimited.